Vamo V5 Review: Top Features, Ratings, Pros & Cons! Home → E-Cigs → Vamo V5 Review: Top Features, Ratings, Pros & Cons! A thousand greetings to all to those flavor chasing vape enthusiasts out there and welcome to this steamy review. Most vape mod lovers will be familiar with Vamo as a trusted provider of quality, affordable and durable vaping mods that can really keep those clouds rolling. So if you’re looking for a sweet looking, adjustable voltage mod to pack some punch into your Clearomizer tank, then the Vamo V5 might just be the one for you and I suggest you keep reading this Vamo V5 mod Review. I’m going to give you a closer look at the special features and specs of this affordable piece and help you to invest in the vaping mod that’s the right fit for you. As an easy to use and rather affordable 15 Watt W/VW APV mod, with a similar shape to the previously released Vamo V2 but with sleeker, upgraded looks, the piece matches up nicely to the Kanger range of products and I’m quite a fan of teaming it up with the Protank 3 Mini for a full, flavorsome vape. I was more than happy to award a cool 4.5 Stars at the end of this review. My experience with the mod, leading up to this review covers about 3 months, I’ve found it to have some really nifty qualities, easy to use, plus I really like the looks, a straight, smooth design in super shiny chrome. So this upgrade came out with a score features, many of which were also in the Vamo V3, including a neat OLED screen and adjustable voltage/wattage. Looks: I’m actually quite crazy about the looks on this mod, the sleek chrome - available in stylish black, chrome or stainless options, as well as the cute little OLED screen, make this a very attractive mod to hook up to your clearomizer system. During this Microcig Vamo V5 Review, I mostly had it hooked up to my Kanger Protank Mini, there’s just something really cute about it. Design: I like the sturdy yet slim feel of the piece including the easy to-screw-on extension which allows you to switch between the different battery options of single18650, single18350 and dual 18350. I little rectangular OLED screen allows to read your voltage and clearomizer resistance display. Functions: Little round buttons allow you to easy adjust both the wattage and the voltage, the controls are easy to use and you won’t need to struggle with a complicated menu. 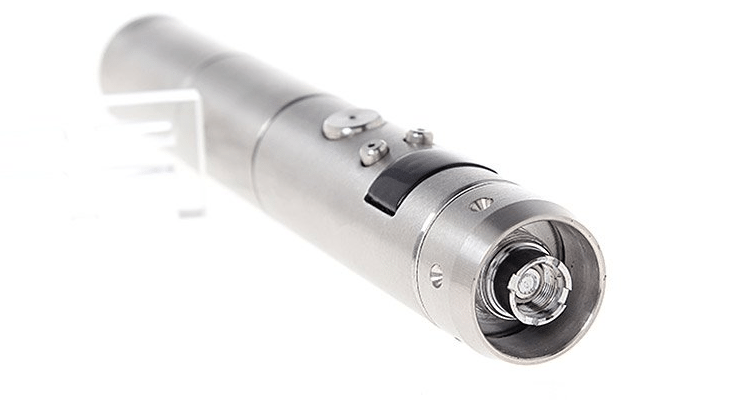 This is one of the simplest vaping mods to run and I found it to be an absolute breeze to use. There’s another little button for your operation of the mod. If you keep your finger on the button the right for 2 seconds you can see the resistance of the clearomizer in Ohms, on the left button for 2 seconds you can check just how much battery power you’ve got left. Holding down both buttons will allow you to access the menu whilst the button on the left will let you scroll down. Compatibility: The Vamo V5 is both eGo connection and a 510 connection which does make it a little more compatible, although the 510 connection can be somewhat wobbly. The Vamo V5 is also compatible with a number dry herb and other attachments so just about any vapes will be able to make good use of it. Length: The Vamo V5 measures in at about 14 centimeters, which makes it a little tricky to carry in your purse and the only way to really alleviate this is to use the smaller battery sizes, so that’s definitely something to take into consideration before making your purchase. Connection: Another issue I noticed and that I’ve seen from a number user reviews is the sketchy 510 connection but an affordable way to fix this is by investing in a tank air controller, which will add some resistance to your draws. All you need to do then is just connect to your battery….unfortunately this, in turn, will add a little bit of length to a device that is already particularly lengthy. One pretty cool benefit is the number of custom mod skins available for the Vamo V5, so even if you’re not crazy about the steel, chrome or gunmetal you can still make the piece look awesome. For more info or to buy a custom skin, check out this website. Okay, so at the end of the day Vamo V5 does exactly what it’s purported to do and it does so effectively. In comparison to the V2 and V3, I wouldn’t really consider it to be that much of an upgrade because the only real differences are the superficial designs like the LED screen. It’s got a good range and a couple of cool features, including the little LED screen. Sure, it’s not the mother of all mods but it works dependably and well on all of the different atomizers that I hooked it up to. If you’re on the lookout for an unassuming, sturdy product at a really reasonable price, the Vamo V5 is undoubtedly a good option to consider, I know I’m happy with it and I expect to get many a satisfying and safe vape out of it in future. Further than that all I can say is adios and good luck your purchase, may it serve you well! The Vamo is a great mod, but I think the days of the big clouds and large vapes is over. Pod based vaporizers are the future!